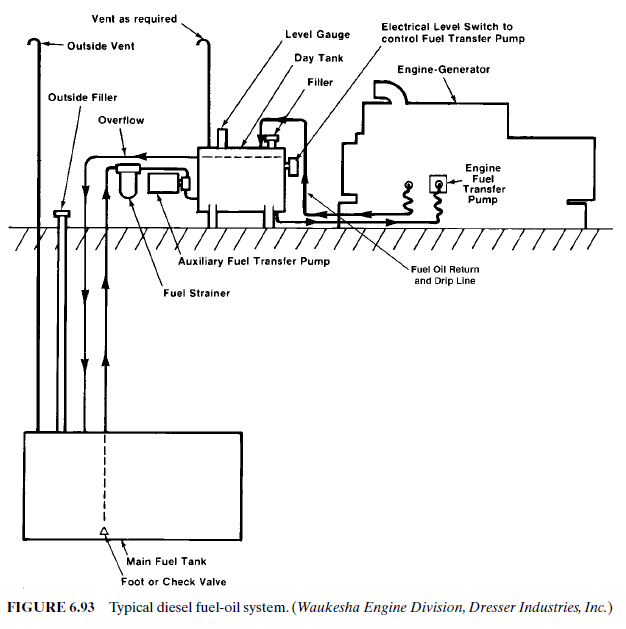 Installation of a diesel engine requires special planning to handle fuel delivery, storage, and piping (Fig. 6.93). Fuel Tanks. 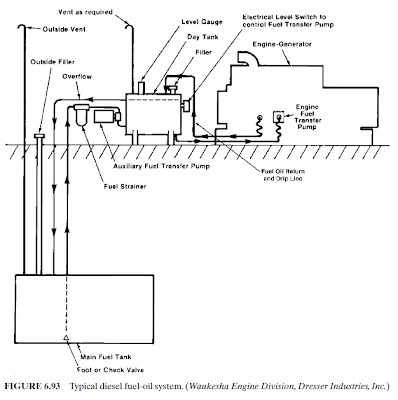 Most diesel engine installations utilize a two-tank system, with both a main storage tank and a day tank. Day Tanks. A day tank is designed to keep a clean supply of fuel oil close to the engine and to provide an immediate supply of fuel when the engine is started. By locating the day tank close to the engine, the fuel transfer pump will be able to draw fuel more easily, without having to develop high suction pressures. The day tank is generally sized to hold enough fuel for several hours of operation or whatever local fire codes allow. It is often a 275-gal (1000-L) standard commercial tank installed at or above floor level. If the day tank is positioned above the level of the engine fuel-transfer pump, the flow of the fuel will maintain a constant pressure at the fuel-transfer pump inlet. A positive shutoff should be added just beyond the day tank whenever the tank is above the level of the fuel-injection pump. If the day tank is mounted on a structure that is subject to vibration, a flexible connector should be added between the tank and the fuel piping. (Actually, flexible connections are recommended between an engine and any support system, whether it involves fuel, air, water, or oil.) The weight of both the tank and the fuel must be considered when designing and mounting the tank. Main Storage Tanks. Spherical or cylindrical tanks should be used for added strength. Avoid square tanks. Main storage tanks are generally large enough to hold a 10-day fuel supply. (Local codes may dictate tank sizes.) If fuel delivery is uncertain due to weather, traffic, or any other reason, the tank size should be increased. The location of the main storage tank is influenced by the method of delivery. If the fuel oil will be delivered by railroad tank cars, the tank and filler opening should be near the railroad siding. If a truck will be delivering the fuel, the tank and filler opening should be close to the road. Tanks should always be located so as to minimize the length of the fuel lines. filler opening should be close to the road.Tanks should always be located so as to minimize the length of the fuel lines. Underground fuel-oil tank storage is no longer permitted. Above-ground storage does require containment around the tank, and heating may be required in cold climates. As with day tanks, the fuel pickup should never draw from the bottom of the main storage tank. The tank should be installed lower at one end to allow the dirt and water that settle out of the fuel to be drained off or pumped out. Underground tanks should be bottom pumped at least twice each year to remove all accumulated water and sludge. Above-ground tanks are more subject to condensation, so they should be bottom pumped more frequently. Caution: Diesel fuel tanks, fittings, and lines should never be made of galvanized steel nor should they be of a zinc alloy material. The sulfur in the fuel will corrode these metals, gumming up the injection pump and injectors. Heating lines can be added to warm the fuel and keep it at a temperature at which it can be easily pumped to the engines.The manufacturers of such components should be consulted for further information. The vent pipe to the outside must have at least a 1-in (2.5-cm) diameter, and an approved flame arrester must be incorporated into the vent. Strainers and Filters. Strainers and filters are an important part of any diesel fuel system. Without the cleaning action of these components, the dirt and grime in the fuel would destroy the finely machined parts in the injectors and the injection pump. A filter should be placed just before each meter and each pump.To ensure proper maintenance, it should be located in an easy-to-reach position.Also, try to leave enough room under each filter for a catch basin to avoid messy, dangerous fuel-oil spills. Separators should be added to a system, particularly at the main storage tank outlet, to remove sediment. Shutoff Valves. A shutoff valve should be incorporated in the fuel system at the fuel tank outlet and at the point where the fuel line enters the building or engine room and wherever applicable local codes so dictate. Fuel-Transfer Pumps. Transfer pumps are used to supply fuel to the injection pump, or to raise fuel to a tank or engine at a higher level. Centrifugal pumps cannot be used as transfer pumps because they are not self-priming. Positive-displacement pumps must be used. Fuel Return Lines. Fuel return lines take the hot excess fuel not used in the engine cycle away from the injector and back to either the fuel storage tank or the day tank.The heat from the excess fuel is dissipated in the tank. CAUTION: Never run a fuel return line directly back to the engine fuel supply lines. The fuel will overheat and break down. The fuel return lines should always enter the storage or day tank above the highest fuel level expected. This will prevent fuel in the storage tank from running back into the fuel return line.